HA NOI (VNS) — Ha Noi market gardeners established another 500 hectares of safe vegetables in the first quarter of this year. This brings the total area for this type of cultivation in the province to 5,000 hectares, reports the city's Department for Agriculture and Rural Development. In Viet Nam, safe vegetables are those that are raised without chemical-intensive practices, often applying excessive amounts of chemical fertilisers and using dangerous pesticides. In some regions, the quality of ground water and the soil itself is often questionable because of the dumping of toxic waste and the war-time defoliants. The idea of safe vegetables is far from new. They have been grown in Viet Nam and the rest of the world for thousands of years using natural compost and natural pesticides. However, in recent years, many Vietnamese farmers like their colleagues around the world, have embraced chemical-intensive production, creating a growing demand for higher quality vegetables. By adopting integrated pest-management practices, using compost and rotating, farmers have been able to reduce their reliance on chemicals. In 2009, Ha Noi launched a project to promote the production and consumption of safe vegetables. Head of the agricultural department's Plant Protection Division, Nguyen Duy Hong, said that the division was operating centres for testing the quality of vegetables and granting certificates to those that passed the test. The division is guiding 18 safe-vegetable production areas across Ha Noi. They are all using good agricultural production standards. Hong said that farmers in these areas were taught how to grow safe vegetables and ways to improve productivity. Thirty-one safe vegetable producers had been granted codes that enable authorities and consumers to trace the origin of the fruit and vegetables - and promote a trademark, he said. Four vegetable processing units have been established. 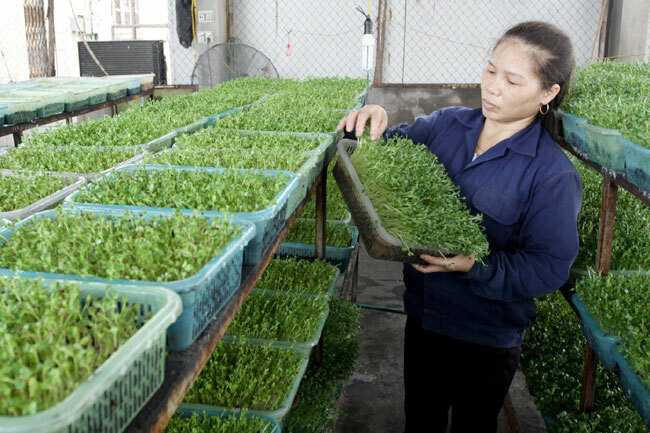 They can handle up to five tonnes per day in production areas such as Van Duc Commune in Gia Lam District, Yen My and Duyen Ha Communes in Thanh Tri District, Thanh Da Commune in Phuc Tho District. More than 80 vegetable shops and 180 stands in supermarkets across the city have also met criteria for selling safe vegetables. Each sells an average of 50 to 120kg of vegetables daily.